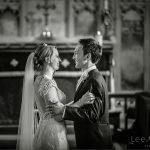 I met Lisa and Nick at a local wedding fair and I must have said something right, for them to inquire and then book with me to capture their wedding. I think it’s fair to say, that this couple didn’t want a a lot of attention focused on them, on their wedding day. On the way to the church in Wolvey, we made a detour to Nuneaton in Warwickshire to visit her grandma who was in a nursing home. I thought this was a really beautiful touch, and proved how much family means to us during these times. After the wedding ceremony, there was a little drive to Dunchurch Park Hotel Rugby, for the wedding breakfast. We managed to get the majority of the wedding images, before the heavens opened, and we then had to retreat inside. Lisa and Nick’s were such a lovely couple to photograph, and they really enjoyed their Warwickshire wedding. While reviewing these images, ready to put online, it’s so nice to see the documentary wedding images of wedding guests and family, enjoying this couples special day.